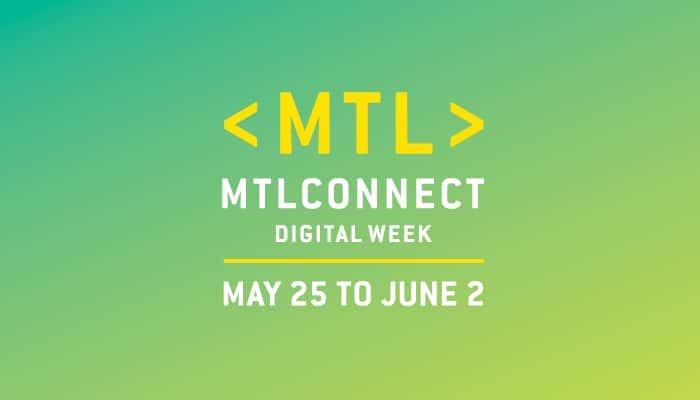 Montreal, February 15, 2019 ― Montreal Digital Spring is announcing <MTL> connect: Digital Week, a new annual event to be held from May 25th, to June 2nd, 2019. Using digital intelligence as the overarching theme, this international event aims to look across the board at the main questions related to digital development, focusing on its economic, social, cultural and environmental impacts in various sectors of activity. “Montreal Digital Week conveys the vision of a new world, conceived with audacity, promoting the quality and diversity of content and carrying the vision of a bold, innovative, avant-garde and human metropolis” said Suzanne Gouin, Chair of the Board of Directors of Montreal Digital Spring. By broadening the scope of this event using a cross-cutting approach that differs from existing events and by leveraging its vast network of partners, Montreal Digital Spring aims to build a momentum that will contribute to position Montreal as the world capital for its digital scene. The organization will also ensure the transfer of expertise between different ecosystems and encourage the cross-fertilization of knowledge. “Montreal is a hotbed of knowledge and an incomparable pole of innovation and creativity. Events such as the Montreal Digital Week highlight this richness and dynamism and contribute to the influence of our metropolis on the international scene” said Valérie Plante, Mayor of Montreal. The Executive Committee of the City of Montreal provided a financial contribution of 250,000 $ to Montreal Digital Spring. This amount is intended to support the repositioning of the organization as well as the inception of the Montreal Digital Week. “The new positioning of Montreal Digital Spring will contribute judiciously to the priorities set out in the City of Montreal’s Economic Development Strategy. The Montreal Digital Week will not only participate in talent attraction and retention efforts, it will also contribute to the digital transition of companies as well as the commercialization of innovations” added the Head of Economic Development, Trade and Government Relations to the Executive Committee, Robert Beaudry. The Montreal Digital Week program is structured around five thematic pavilions: Architecture and buildings; Artificial intelligence; Transportation and mobility; Health; Cultural and creative industries. Each pavilion will feature conferences, showcases and discovery areas. While the activities opened to the general public will be held over two weekends, the events targeting the industry professionals will be available for five days. All activities and conferences will be held in various cultural, academic and industrial institutions in Montreal. During the event, part of the Montreal Digital Spring mandate will be to attract and generate activities led by partner organizations during the nine days. As part of the first edition of <MTL> connect: Digital Week, Montreal Digital Spring is launching a call for speakers to participate in panels and conferences, discuss current practices and encourage the sharing of innovative ideas. All details and selection criteria are available HERE. The 6th season of the Montreal Digital Spring will take place from March 21 to June 21, 2019. Organizations can register their activities directly on the website by logging into their member account if they are already partners, or by registering as an “organizing partner” HERE. For any questions or any additional information about registering your activities as part of the 6th edition of Montreal Digital Week, please contact Agnès Merlin, Communications and Partnerships Officer, at [email protected], 514-842-2400 ext. 2138.